Bathroom wars. You want a fabulous smelling, deeply moisturizing body wash. He wants a simple, no scent cleanser. You want a sudsy experience. He wants to be out of the shower in 1 minute 38 seconds flat. You want choices and pretty bottles. He wants soap, shampoo, and if you’re lucky, maybe a razor and conditioner. 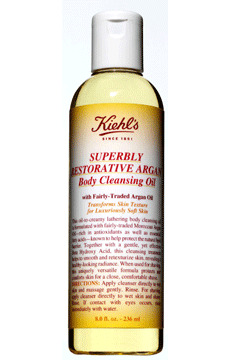 Kiehl’s Superbly Restorative Argan Body Cleansing Oil plays a pretty ambassador. He’ll see it as a no-frills cleanser that doesn’t do big bubbles and is practically scentless (although you will detect lingering sweet orange, eucalyptus and cedarwood -- very mild and clean). You’ll love the soothing and restoring organic, fairly-traded argan oil -- Moroccan “liquid gold” as Josie Maran once put it. This one also doubles wonderfully as a shaving oil, so you can chuck your other canister. He’s smiling. You’re smiling. Ah, bliss in a bottle.